In probability theory and statistics, the continuous uniform distribution or rectangular distribution is a family of symmetric probability distributions such that for each member of the family, all intervals of the same length on the distribution's support are equally probable. The support is defined by the two parameters, a and b, which are its minimum and maximum values. The distribution is often abbreviated U(a,b). It is the maximum entropy probability distribution for a random variable X under no constraint other than that it is contained in the distribution's support. The values of f(x) at the two boundaries a and b are usually unimportant because they do not alter the values of the integrals of f(x) dx over any interval, nor of x f(x) dx or any higher moment. Sometimes they are chosen to be zero, and sometimes chosen to be 1/(b − a). The latter is appropriate in the context of estimation by the method of maximum likelihood. In the context of Fourier analysis, one may take the value of f(a) or f(b) to be 1/(2(b − a)), since then the inverse transform of many integral transforms of this uniform function will yield back the function itself, rather than a function which is equal "almost everywhere", i.e. except on a set of points with zero measure. Also, it is consistent with the sign function which has no such ambiguity. For a random variable following this distribution, the expected value is then m1 = (a + b)/2 and the variance is m2 − m12 = (b − a)2/12. For n ≥ 2, the nth cumulant of the uniform distribution on the interval [-1/2, 1/2] is bn/n, where bn is the nth Bernoulli number. This fact is useful when making Q–Q plots. 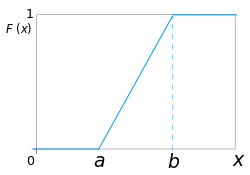 The probability that a uniformly distributed random variable falls within any interval of fixed length is independent of the location of the interval itself (but it is dependent on the interval size), so long as the interval is contained in the distribution's support. which is independent of x. This fact motivates the distribution's name. This distribution can be generalized to more complicated sets than intervals. If S is a Borel set of positive, finite measure, the uniform probability distribution on S can be specified by defining the pdf to be zero outside S and constantly equal to 1/K on S, where K is the Lebesgue measure of S.
, the resulting distribution U(0,1) is called a standard uniform distribution. One interesting property of the standard uniform distribution is that if u1 has a standard uniform distribution, then so does 1-u1. This property can be used for generating antithetic variates, among other things. If X has a standard uniform distribution, then by the inverse transform sampling method, Y = − λ−1 ln(X) has an exponential distribution with (rate) parameter λ. If X has a standard uniform distribution, then X is also a special case of the beta distribution with parameters (1,1). The Irwin–Hall distribution is the sum of n i.i.d. U(0,1) distributions. The sum of two independent, equally distributed, uniform distributions yields a symmetric triangular distribution. The distance between two i.i.d. uniform random variables also has a triangular distribution, although not symmetric. In statistics, when a p-value is used as a test statistic for a simple null hypothesis, and the distribution of the test statistic is continuous, then the p-value is uniformly distributed between 0 and 1 if the null hypothesis is true. There are many applications in which it is useful to run simulation experiments. Many programming languages come with implementations to generate pseudo-random numbers which are effectively distributed according to the standard uniform distribution. If u is a value sampled from the standard uniform distribution, then the value a + (b − a)u follows the uniform distribution parametrised by a and b, as described above. The uniform distribution is useful for sampling from arbitrary distributions. A general method is the inverse transform sampling method, which uses the cumulative distribution function (CDF) of the target random variable. This method is very useful in theoretical work. Since simulations using this method require inverting the CDF of the target variable, alternative methods have been devised for the cases where the cdf is not known in closed form. One such method is rejection sampling. The normal distribution is an important example where the inverse transform method is not efficient. However, there is an exact method, the Box–Muller transformation, which uses the inverse transform to convert two independent uniform random variables into two independent normally distributed random variables. 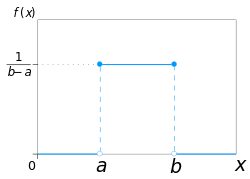 In analog-to-digital conversion a quantization error occurs. This error is either due to rounding or truncation. When the original signal is much larger than one least significant bit (LSB), the quantization error is not significantly correlated with the signal, and has an approximately uniform distribution. The RMS error therefore follows from the variance of this distribution. where m is the sample maximum and k is the sample size, sampling without replacement (though this distinction almost surely makes no difference for a continuous distribution). This follows for the same reasons as estimation for the discrete distribution, and can be seen as a very simple case of maximum spacing estimation. This problem is commonly known as the German tank problem, due to application of maximum estimation to estimates of German tank production during World War II. the maximum order statistic of the sample. The midpoint of the distribution (a + b) / 2 is both the mean and the median of the uniform distribution. Although both the sample mean and the sample median are unbiased estimators of the midpoint, neither is as efficient as the sample mid-range, i.e. the arithmetic mean of the sample maximum and the sample minimum, which is the UMVU estimator of the midpoint (and also the maximum likelihood estimate). Irwin–Hall distribution — In the degenerate case where n=1, the Irwin-Hall distribution generates a uniform distribution between 0 and 1. Bates distribution — Similar to the Irwin-Hall distribution, but rescaled for n. Like the Irwin-Hall distribution, in the degenerate case where n=1, the Bates distribution generates a uniform distribution between 0 and 1. ^ Park, Sung Y.; Bera, Anil K. (2009). "Maximum entropy autoregressive conditional heteroskedasticity model". Journal of Econometrics. 150 (2): 219–230. CiteSeerX 10.1.1.511.9750. doi:10.1016/j.jeconom.2008.12.014.